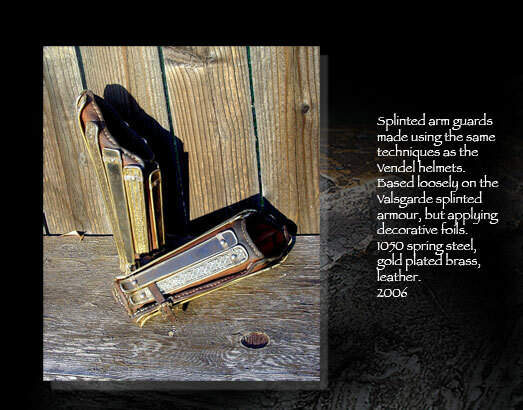 The Men -at- arms book by Osprey, 'Saxon, Viking and Norman', should have some of the information that you need I think. The Vendal period is not really my area, but I seem to recall that this book had quite a lot of things from this era in it. 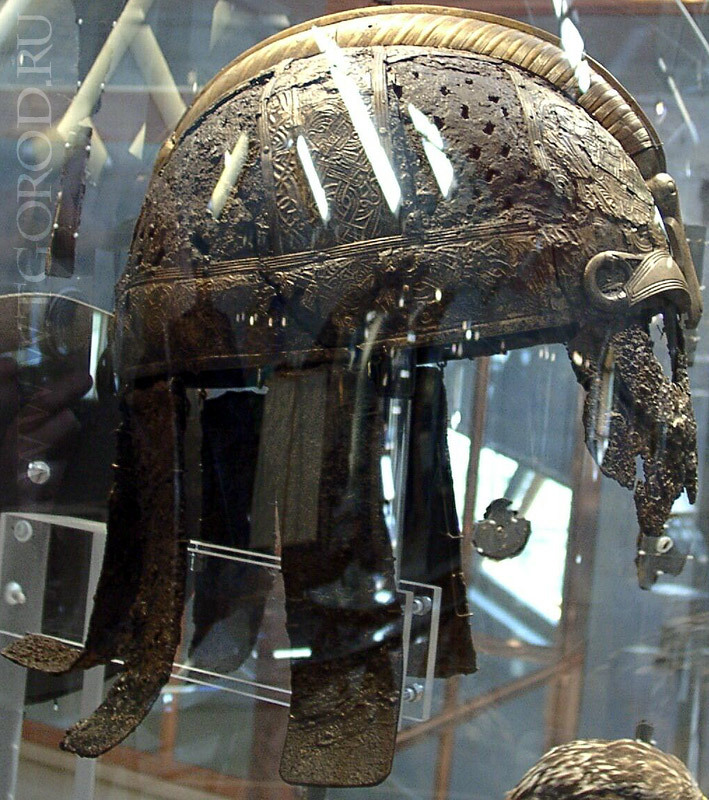 The Sutton Hoo helmet may also be of scandinavian workmanship, though obviously this was a princely piece! 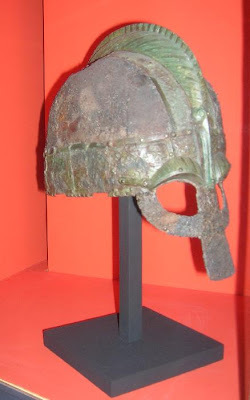 If you can find a copy in the library, 'The Anglian helmet from Coppergate' by Dominic Tweddle has lots of good photographs of many of the helmets found at Ulltuna and Valsgårde. It also has quite a bit on designs from the period. Sadly, it is out of print now and extremely difficult to obtain, so your library is the best bet. If I think of any more I will post you the details. 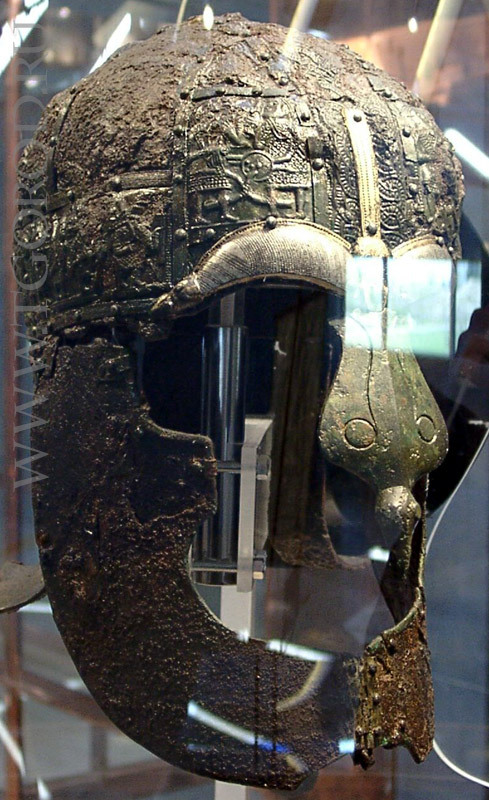 Sutton Hoo is probably an ideal case for your objectives. The finds are considered to be "inspired" by Northern Germanic tribes, but South German / Lombardic/ Swabian Germanic tribe in terms origin (one of a kind on several points if actually Scandinavian in origin). The reasons are complex. The alloys of the amalgum, the origins of the Garnets (geologically traceable, and known in terms of who traded them and used them in crafts) and some construction specifics, plus origins of coins, point to Southern Germanic regions as a point of origin. Time frame 600's to 700's A.D.) is within your stated objective as well. You can find references pretty quickly (try searching on Merovingian Garnet jewelry). The style and mineralology of the Sutton Hoo Garnet and their credible origins is most consistent with Merovingian, which fits very well with the theme you have stated. As Chris has posted there are a fair deal of vendel period goods in existance today. Sadly Tweedle's book is the best I know of with pictures of them with dates. 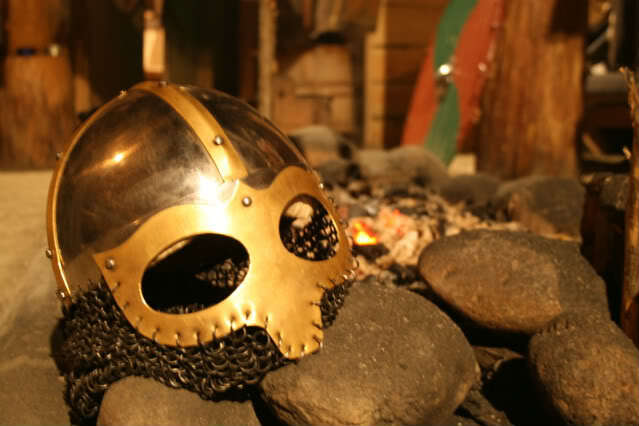 There was an excellent website on vendel and viking helmets but I cannot find it anymore. Here is a Vendel kit I made for myself. Great job Chris! I like that a lot. I prefer a little more mundane/ practical look in all matters about my own dress. Your work appears nice enough to be the sort of thing a chieftain would have coveted. Damn! That a good loking kit. I´m very impressed. I´m curios about you coat. How is it made? I´m thinking of making some kind of cloak myself. I will probaly use wool. Coat is a bearskin draped and pinned nose to leg. I recently bought one of Albin’s large fine silver broaches for it, really looks nice against the black fur. I also use a wool cloak, although the bear is pretty wam on cold nights. I used Dominic Tweedle’s book for much of the reference along with items from a book from the 30’s (sorry I don’t have the title to memory.) that has to original (incorrect) Vendel 14 illustration. I did not make the mail, but I am planning on a major tailoring of it. I’m wearing a quilted leather coat underneath the mail. I fought at Moesgaard 2 years ago and it was very comfortable. The shield held up surprisingly well against the steel weapons, almost no damage other than some minor denting to the rim and a slight scuffs to the rawhide. These are absolutely stunning! 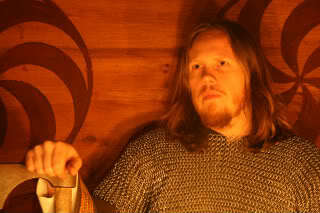 I am into Vikings and Anglo-Saxons, and I find that I am liking Vendel-period stuff more and more! 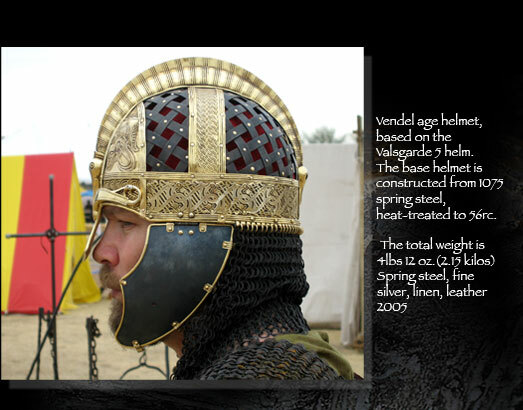 Out of curiosity, what does the "accurate" Vendel helm look like? Is there a pictorial reprsentation somewhere online? Here is a few pictures of the originals from Vendel and Valsgärde. 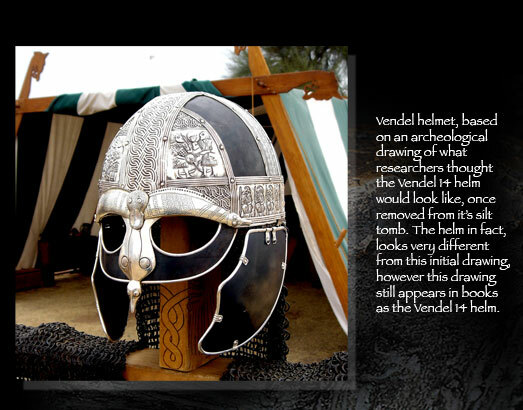 The 4th picture down is the Vendel 14 helm in it's correct(?) configuration. The last two pictures is the original, that my helmet (gold one) is based on. I chose not to use the "goggles" and plates in the back. That first helmet, the one with the mail (would that be an aventail or something else?) is without a doubt one of the scariest looking pieces of armor I've ever seen. The open weave helmet is one of the most interesting to me because I feel whoever thought of it was way ahead of their time. Were the people in the Vendel period wealthier than their Viking descendants? Or is it just "accidental" that the Vendal armor that has survived is so beautifully decorated? For some unknown reason the graves in Vendel, Valsgärde and Ultuna where not pyres. In other areas in the same period and in poorer graves as well as during the later periods the custom seems to have been fueral pyres and that of course make the finds in those graves not as rich. In addition the grave from the Vendelperiod seem to have been respected for a long time and have not been subject to graverobbing. Lastly they in addition to above seem richer that their later successors. My own theory is that the tradition of going south to serve with or against rome/byzans made thiese guys rich and they continued to go generationa fter generation. But that is just speculations on my behalf. Was this beautiful armor worn in battle or was it for show? Do the archeologists have an opinion on that? I've read commentary elsewhere which says that those "eye holed" helmets were dangerous because they channeled blades towards the wearer's eyes. I've never been convinced that that argument rings true except that some of the replica helmets seem to have huge eyeholes that would seem to defeat the purpose. Are there any known linguistic borrowings that have remained in the Norse languages from dealings with the Romans and Byzantines? Do you know if the Romans distinguished "Scandinavians" from "Germans" or were they all just lumped together in the Roman mind. Some of the reading I've done seems to say that the Romans had a somewhat strange attitude towards "Germans". On one hand the Emperors guard was made up of Germanic tribesman somewhat like the Pope's Swiss Guard but on the other hand Rome looked at Germanic peoples as a menace and the "German" individuals as not only barbarians (they were) but something like tamed wolves. Apparently the Romans saw Germany as one huge dark rainy forest, sort of the way Americans think of England except more trees! I'm putting German in quotes because they didn't think of themselves that way at that time. 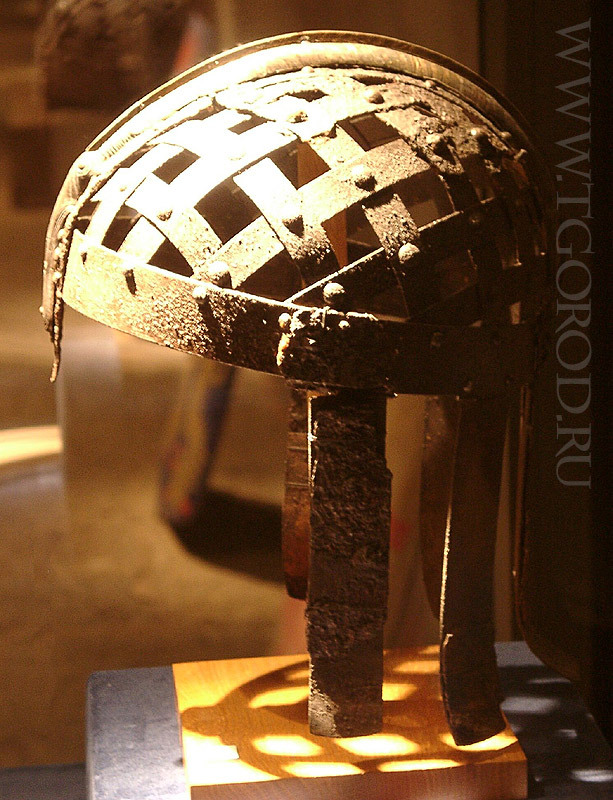 Here the theory of the archeologists is that it is Parade helmets. But that is old interpretations and they don´t hold up in my oppinion. I have made a simplifyed version of the helmets and I have tried that one and it has interessting qualtitys. It works like a modern hockeyhelmet or bicycle helmet. It is has some spring to it that catch the force of a blow. The spectacles does not funnel the strikes into the eyes. And one of the original helmets has one of the silverplates redone. I interpret that as a repair after some damage. Yes some! 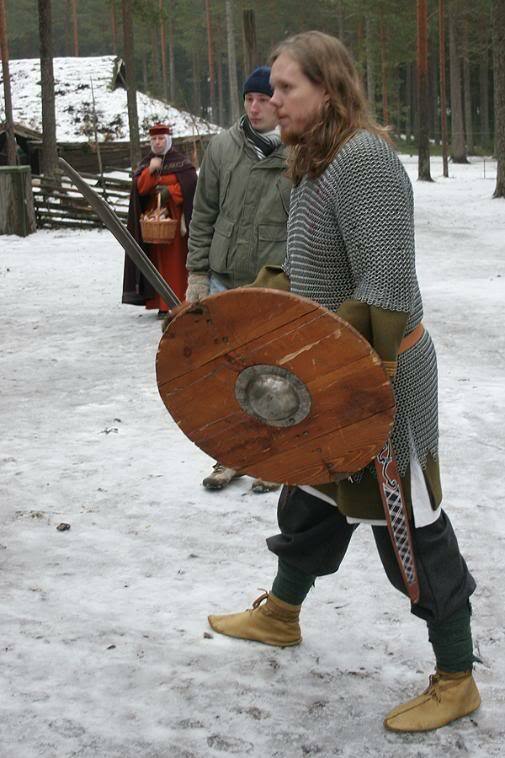 But they could be from later periods like the early medieval time (vikingperiod) when we know that scandinavians served in the Varingian guard. Well, hard to tell. The romans and Byzantinians names lots of different tribes but that is in more learned sources. The romans and byzantinians would in my belive generally not distinguish between the Germanic/slavic speaking tribes of the north. All above is as to my present knowlage! 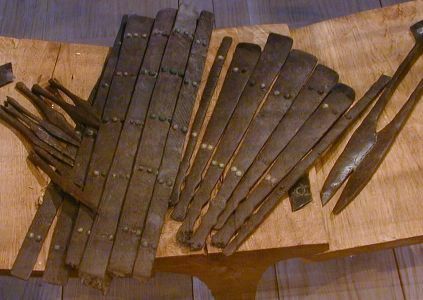 Here is a photo of the splints from one of the graves. I worked at a Bronze age museum for a summer. There I learned about a roman text that descrbied people from what was interpreted as Sweden/Denmark. They where said to come in their black ships from the north to trade with the romans in germania. I don´t know any more than that since the archelogist at the musem told it to me. With some searching one could probaly find out wich text he was talking about. I like those splints. I have heard a theory that they where used on the shins. When you stand in a shieldwall you body is protected but your shins are vulnerable. Well, OK, if they say so. I have to admit that those things don't look like leg protectors to me. Maybe its seeing them in a photo as opposed to seeing them in fact. Do you think it makes sense that the Vendal period warriors would have such incredible helmets and swords and those sticks as leg protectors? Don't misunderstand I appreciate the information, I just don't think I have enough to visualize it correctly. The only thing that I have heard of that is even close to this is that there were supposedly Norwegian Vikings who wrapped their lower legs in birch bark before going into battle. They were referred to as Birken something or close to it and NO it isn't Birkenstocks! Even this I take with a huge grain of salt because the reference comes from the name that a Norwegian manufacturer gave to a hunting knife. I found it at a site called Ragweed Forge, his business is selling Scandinavian knives on this side of the Atlantic but he has some links you guys might find interesting. In some ways I can't decide which is more amazing the actual Vendal helmets or the incredible reproduction helmets that were pictured here. 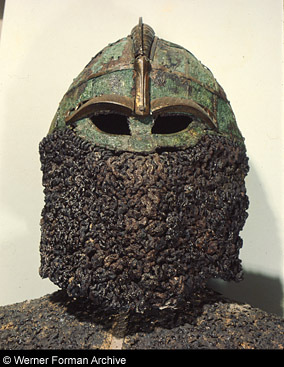 I have seen these reconstructed (or ones like them) as body armour, I think they are greaves not body armour. When I was making my helm, I asked myself the same question, "If they had such amazing helmets, shields and such, why wouldn't they have done the same treatments to splinted defenses." So I made these splinted vambraces to go with my helmet and am planning to make splinted greaves to match. page from "Arthur and the Anglo Saxon Wars" by David Nicolle PhD.